The Home Energy for Tomorrow (HE4T) project is a collaborative effort between London South Bank University and project lead ICAX Ltd. and is supported by Anglian Water and Thames Water, as part of their ongoing energy innovation work. The project is also part funded by the BEIS's Energy Entrepreneur’s Fund. The aim of the HE4T project is to explore heat recovery potential in the urban water cycle, and use this information to promote this technology in the UK. It will look at how water systems (both potable water and waste water) can be connected to the heat pump to boost efficiency - turning the water utilities into energy carriers. Currently an innovative heat pump is being developed & tested by ICAX Ltd. in the laboratory at LSBU. Thames water and Anglian water are collecting sewage temperature and flowrates data at various potential locations across London and Midland area, in order to better estimate the potential for wastewater heat recovery. 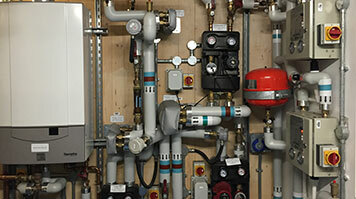 Utilising secondary heat sources can play a critical role in meeting the UK’s carbon targets. Recovering waste heat from sewage is an attractive option as it can help the UK decarbonise the heating sector and reduce the reliance on fossil fuels. However, wastewater as an energy source has so far been underutilised due to a range of barriers including: the uncertain impacts of lowering sewage temperatures on sewer network (Increased blockages, reduced sewer capacity, risk of damage to sewer pipes), on Wastewater Treatment Plant (WWTP) efficiency, heat pump operational costs; relatively low cost of natural gas and longer payback period of heat recovery systems. There is a growing interest in the UK to explore this new technology after the successful sewage heat recovery demonstration project at Borders College, Galashiels, Scotland - a joint venture between Scottish Water Horizons & SHARC Energy Systems, utilising two 400 kW heat pump system (COP = 4.8) that deliver 95% of space heating and hot water requirements of campus. According to Heat from Wastewater, the retrofitted system provides 1.8 GWh of annual heat, saving 150 tonnes of CO2 emissions per annum with no impact on the local sewage network. 16 billion litres of sewage is conveyed through 624,200 kilometres of sewer pipes to 9,000 WWTPs across UK daily - the potential of heat recovery is significant. Typical sewage temperature in UK sewers vary from 10 to 25 °C with a yearly average of 17.5 °C. Theoretically, if above daily discharge is cooled by 3 °C for heat recovery, it is possible to recover up to 20 TWh heat energy annually, enough to heat 1.6 million homes. In practice the total amount of available heat is a function of wastewater/effluent flow rates, type of sewer system (foul/combined), level of ground water intrusion, initial temperature of the wastewater/effluent, minimum temperature requirements for the wastewater/effluent and efficiencies of the heat exchanger and the heat pump etc. As shown above, there is much theoretical potential along with significant opportunity for future energy recovery and emissions reduction in the longer term but the UK needs to overcome major practical constraints; limited awareness of heat pump technology, low cost of gas and a lack of energy networks infrastructure. The HE4T project is led by Professor Andy Ford, Dr Aaron Gillich, Dr Alex Paurine and Dr Shazia Farman Ali. Mark Hewitt, Edward Thompson, Gary Page, Carl Lawson, Francois Badinier, Jonathan L'Hostis and Josh Cornford. Mr Dejan Vernon, Principal Research Scientist.